What do you get when you put a couple of cruise enthusiasts and the Managing Director of a major cruise line in one room? A wonderful evening talking all things cruise! That’s what happened a few days ago when Norwegian Cruise Line invited us for a fabulous dinner in HoogtIJ, a unique rooftop venue overlooking the skyline of Amsterdam. One of the highlights for summer 2019 will definitely be the addition of Norwegian Pearl as the sixth ship to sail in Europe. The 2,400 passenger Norwegian Pearl will offer new and varied itineraries from Amsterdam, a strategic pre-and-post cruise port where guests have easy access to the heart of the city as well Europe’s third largest and fastest growing airport. Norwegian Pearl will also embark on a variety of Mediterranean sailings from Rome/Civitavecchia, Barcelona and Venice. Norwegian Pearl is joining Norwegian Getaway who will be sailing from Copenhagen, Norwegian Epic who is offering seven-day Western Mediterranean cruises (with Barcelona and Rome/Civitavecchia as embarkation ports), Norwegian Jade who is cruising the azure blue waters of the Greek Isles & Italy from Rome/Civitavecchia, Norwegian Star who will sail to the Greek Isles and Eastern Mediterranean from Venice and Norwegian Spirit who will home port in Southampton and sail a selection of 10-day or longer itineraries to the British Isles, Iceland, Norwegian Fjords, the Arctic Circle and the Baltics. Norwegian Cruise Line also announced it is hosting Jon Bon Jovi’s Runaway To Paradise cruise vacations in partnership with Runaway Tours, creators of world-class intimate artists experiences, and Sixthman, the industry leader in music festival vacation experiences. Norwegian Jade will be hosting the Runaway To Paradise Caribbean cruise, sailing from Miami to Nassau, Bahamas on April 12-16, while Norwegian Pearl will host the Mediterranean cruise from Barcelona to Palma, Majorca on August 26-30. The action on Runaway To Paradise will go far beyond the music. Part from sipping Jon and Jesse Bongiovi’s new wine, Hampton Water rosé, and enjoying the stunning amenities of Norwegian Cruise Line’s Jewel class ships, guests will get up close with historic memorabilia in the Jon Bon Jovi Gallery, shop for new looks in the Hart N Dagger pop up shop and even enjoy a meal while giving back to those in need at The JBJ Soul Kitchen. All guests will also take home an autographed event lithograph and fans who book in the first 400 staterooms on each cruise will get an opportunity to take a picture with Jon Bon Jovi. In April 2019, Norwegian Joy will reposition to Seattle to offer seven-day voyages to Alaska, replacing Norwegian Pearl as Norwegian Cruise Line’s third ship in the region, joining Norwegian Bliss and Jewel. Prior to her arrival in Seattle, Norwegian Joy will undergo approximately $50 million in upgrades to bring her designs and offerings to be virtually identical to those of her sister ship, Norwegian Bliss. These will include the addition of a Starbucks store as well as enhanced restaurant, bar and entertainment options. To complement Norwegian Bliss’ itineraries and provide guests with more places to explore and experience the natural beauty of Alaska, Norwegian Joy will cruise a variety of itineraries featuring Juneau, Ketchikan, Skagway, Holkham Bay, Icy Strait Point and Victoria in British Columbia. Norwegian Cruise Line will end the hot summer of 2019 with the float out of Norwegian Encore, the fourth and final ship of its Breakaway-Plus class. The keel laying of Norwegian Encore is scheduled for late November 2018 and the ship should be ready for delivery at the end of October 2019. Norwegian Encore will make her debut in Miami in November 2019 to coincide with the scheduled completion of the new Norwegian Cruise Line terminal at PortMiami. For her inaugural season, Norwegian Encore will cruise out of Miami every Sunday, and sail seven-day voyages to the Eastern Caribbean, beginning with her first journey on November 17, 2019 through April 12, 2020. During her weekly voyages Encore will first visit San Juan, Puerto Rico followed by St. Thomas, U.S. Virgin Islands and Tortola in the British Virgin Islands. 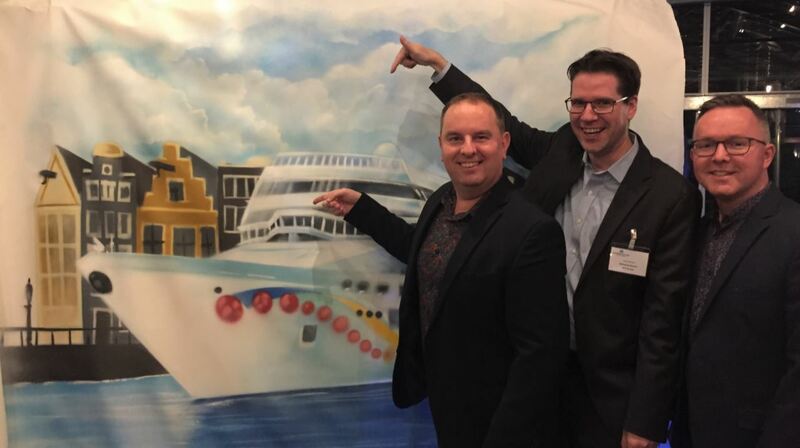 Well-known for their iconic hull designs, Norwegian Cruise Line selected award-winning Spanish artist Eduardo Arranz-Bravo to design the hull artwork for Norwegian Encore. The remarkable design features a labyrinth of color inspired by Arranz-Bravo’s life by the sea in Barcelona and pays tribute to the vibrant guest experience onboard Norwegian Cruise Line’s ships. To find out more and book your next cruise visit www.ncl.com.